The commitment to individual and spiritual development at Ursuline High School is reflected in the philosophy and practices of the Fine and Performing Arts Department. 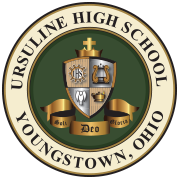 The department’s goals and objectives reflect the mission of Ursuline High School and student motivation, performance, and achievement are enriched through the study and analysis of the various genres within the fine arts.Courses generate an appreciation for the arts and develop self-confidence, self-esteem, poise, self-motivation, dedication, perseverance, and responsibility. The primary focus of the department’s instruction and methodology is the holistic development of all students. All students must complete one full credit in the Fine and Performing Arts in order to meet graduation requirements. A variety of courses are offered to meet individual students needs and interests. Art I is a basic visual and tactile experience whereby students use and apply various media and artistic techniques. This course develops in students an understanding of visual elements in regard to form, line, shape, color, value, texture and a perception of aesthetic awareness. Printmaking involves the creation of a master plate from multiple images will be made. Simply, the artist chooses a surface to be a plate, such as linoleum, styrofoam, wood, or cardboard. The artist will use their plate to cut, etch, or draw an image on the plate. Ink is applied, in a variety of ways, and paper is pressed onto the platter by the hand or the use of a hand-run printing press. Finally, the finished product is pulled from the plate. Painting techniques will be developed to enhance compositions. New Media is an umbrella title for computer manipulated or computer generated art focusing on the aesthetic, conceptual, technical, and social impact of technology based art. This course incorporates digital photography, digital video, graphic design, and animation. Students will have the opportunity to create digital art through the programs of Adobe Suite, Photoshop, InDesign, After Effects, Flash, Lightroom, and Premiere Pro. Students will build a portfolio to showcase their wide range of projects and artists reflections. In this course, students will explore a variety of three-dimensional materials and techniques through sculpture and ceramics. The sculpture portion of the course will include work with metal, wood, plaster, wire, and cardboard to create 3D works. In the ceramics portion of the course, students will learn and apply the basic techniques and building methods to create unique decorative and utilitarian pieces. As projects are completed students will build a digital portfolio to showcase their wide range of projects and project reflections. This is a rigorous college level studio course offered to highly motivated seniors who have taken Art I, II, III, and IV. Coursework is designed to build mastery in technique, composition/design, research, experimentation, and creative problem solving. Critical thinking, objective analysis of artwork, and the ability to communicate in the language of art will be developed throughout the course. Students must be willing to devote several hours per week of outside time to art production, research, and self-improvement. Maintaining an active art journal/sketchbook is a critical course requirement. The “exam portfolio” requires at least 24 high quality artworks to be completed and submitted to the College Board in May. Students will declare their choice of portfolio early in the year, 2D or Drawing, and work in and out of the classroom fulfilling the requirements. Summer work is assigned and must be completed in order to be successful in this course. This course explores the uniquely American art form of Musical Theater from the old classics to contemporary award winners. The Best of Broadway will be studied and viewed. The translation of Broadway hits to film will also be explored featuring such great hits as West Side Story, The Sound of Music, Phantom of the Opera, and Rent. This course will introduce students to the basics of theater production that take place on stage, behind the scenes and off stage. Topics to be studied include: acting, set construction, lighting, sound, costuming, make up, prop design, and stage management. Hands-on activities will be emphasized. Film Study is a one semester elective, open to juniors and seniors. Students will be introduced to the technical, historical and theoretical aspects of filmmaking. Units to be covered include the following: Cinematography and Image, Movement, Editing, Sound, Acting, The Documentary, The Director, Film Criticism and Contemporary Issues in Film. Academic credit is available to any student who has been selected for the cast or crew of an Ursuline High School theatre production. The Director will award credit at the conclusion of the play’s public performance. Academic credit is also available to any student who has been selected for the Speech and Debate Team. The Forensic Director will award credit at the conclusion of the Speech and Debate season. Students will develop musicianship coordinated with movement and expression, appreciate the many varieties of music, work as a unit to reach a common goal, gain confidence in their individual talents, maximize their musical potential and experience all facets of musical training and performance. Marching Band begins in July and runs the length of the football season. Performances include all football games, OMEA competitions, band night performances, rallies, and the St. Patrick’s Day Parade. The Marching Band performs in concert in December and at the December liturgy. STUDENTS MUST BE ABLE TO PLAY AN INSTRUMENT OR BE WILLING TO STUDY A PARTICULAR INSTRUMENT. STUDENTS ENROLLED IN MARCHING/CONCERT BAND ALL YEAR QUALIFY FOR THE BAND SCHOLARSHIP PROGRAMS. PRIVATE LESSONS ARE ENCOURAGED. Concert Band begins second semester and runs throughout the remainder of the year. Performances include the spring concert, OMEA District contests, the fine arts assembly, and the optional spring competition trip. Students will gain an appreciation of the varieties of music, gain confidence in their individual talents, and maximize their musical potential. PRIVATE LESSONS ARE STRONGLY ENCOURAGED. The Marching Band Color Guard is open to any girl in grades 10 through 12. The color guard is comprised of a flag line, dance line, and baton twirlers. All candidates must have the skills necessary to perform in one of these three areas of expertise. Acceptance is based upon an audition. All participants must attend Band Camp and be willing to purchase their uniforms and accessories. Participants will follow the Marching Band schedule of events and abide by the rules and regulations of the Band. This course will make students more aware of the people and events that led to the birth and evolution of Rock ‘n Roll. Through discussions, recordings, and videos, students will gain a better understanding of the history of the Rock ‘n Roll era and the tremendous influence it has had on other musical styles. Students will also develop an appreciation of all musical styles by comparing and contrasting current musical styles and trends with the past. Choir participants will learn various genres of vocal music including show tunes and popular music. Emphasis will be placed on the performance aspects of vocal music. Students will be required to participate in public concert performances. The class will meet two days per week for one semester; students will be assigned to a study hall during the remaining three days. Since the musical selections will change each semester, students may repeat this course multiple times for their Fine Art credit.